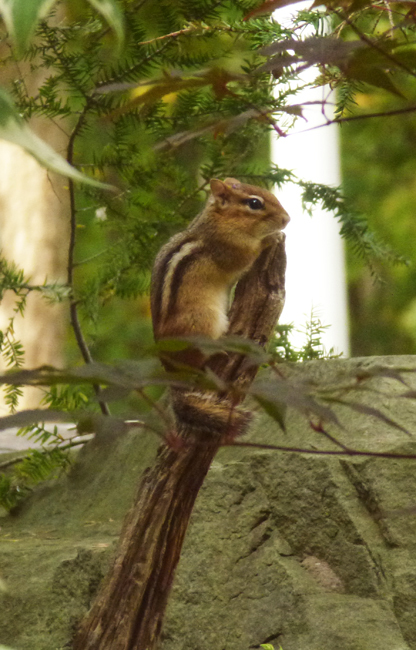 This sweet chipmunk had been scampering about on the ground and then suddenly went up onto this branch and froze. It stayed there for a few minutes and looked to be listening for something and then disappeared off into the bushes. It may have heard a hawk nearby. A great photo - I love it! How cute! You got a great photo of him! Hello, it is a sweetie. Cute photo. Thank you for linking up and sharing your post. Happy Saturday, enjoy your weekend! It certainly looks quite aware of its surroundings. Always zo cute these little curry balls. Chipmunks can be fun to watch unless one is living in your lawn. Then you have problems. Chipmunks really are the cutest! And it's something we never see here! Enjoy your weekend! Perfect photo with a perfect pose! Very watchful and very cute. Gorgeous wee critter Pat, there's so much danger out there!